We'd also like to thank Crescent Printing & Copying of Bethesda, MD for printing our WATESOL Newsletter for conference participants. Keynote on Saturday 10/15: Making creative connections - What does it mean to be literate in the 21st century? Once, not so long ago, reading print on a page, and being able to write print on a page, were sufficient skills for 'being literate'. But communication no longer occurs predominantly through text on paper, and that means new skills are required to be literate. We need to be able to read images and symbols, and understand the way these multiple modes interact with print. But are these really 21st century skills? Join me on a walk through the history of communication to see how we have been creatively connecting these modes for hundreds, even thousands, of years. Communicating through multiple modes is part of our human condition so how can we get back to ‘nature’, particularly in the face of political and bureaucratic discourse that insists on a much more narrow definition of literacy – the kind that can be easily tested. The best way to learn language is by looking at it doing its work in context. Using authentic children’s or teenager literature in the classroom increases engagement and enjoyment and gives a real purpose to learning to read. Yet very often, English language learners are given reading scheme books or abridged works rather than original authentic literature. In this workshop I model a method for using literature to teach how the English language works by looking closely at the writing of authors whose books students love to read. 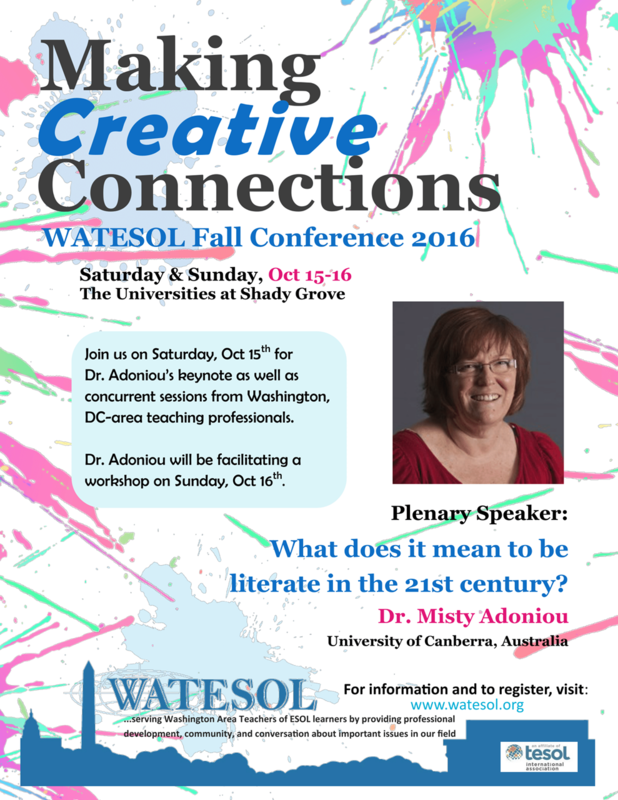 Misty Adoniou is an Associate Professor in Language, Literacy and TESOL at the University of Canberra. She has received numerous teaching awards, including an National Citation for Outstanding Contribution to Student Learning and the 2014 Vice-Chancellor’s Award for Teaching Excellence.